This page provides information specific to ChartDirector for Ruby. 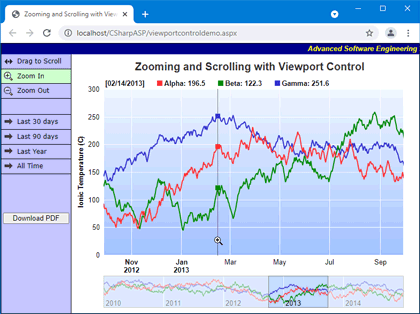 Please refer to the General Features page for general ChartDirector features. ChartDirector for Ruby is completely self-contained and does not required any third party graphics module (eg. "GD" not required). Includes plenty of Ruby On Rails charting sample code in a ready-to-run Rails 3.0 application, as well as plenty of command line Ruby charting sample code. Ruby 1.8.0 or above on Windows, Linux or Mac OS X.